Botanical Name: 1. Dendrobium nobile Lindl. ; 2. Dendrobium loddigesii Rolfe. ; 3. Dendrobium candidum Wall. ex Lindl. ; 4. Dendrobium chrysanthum Wall. ; 5. Dendrobium fimbriatum Hook. var. oculatum Hook. Part Used & Method for Pharmaceutical Preparations: The stems are gathered in the period between summer and autumn, dried in the sun and cut into pieces. Functions: 1. To tonify the yin and clear heat; 2. To promote the production of body fluids and nourish the stomach. 1. Yin consumed by febrile diseases or deficient yin in the stomach manifested as dry tongue, thirst and red tongue proper with scanty coating. 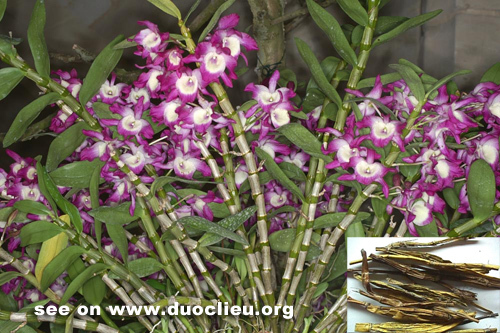 Dendrobium (Shihu) is used with Ophiopogon root (Maidong), Glehnia root (Shashen) and Fresh rehmannia root (Shengdihuang). 2. Afternoon fever caused by deficient yin and internal heat. Dendrobium (Shihu) is used with Fresh rehmannia root (Shengdihuang), Swallowwort root (Baiwei) and Asparagus root (Tianmendong). Cautions & Contraindications: This herb should be cooked first before the other herbs are added to the decoction. It is contraindicated for a person in the early stage of febrile disease.